The Cedar City Half Marathon run takes places each year in September. The next race will be Saturday, September 8th, 2018 at 7:00 am. The race starts at Woods Ranch, 11 miles up Cedar Canyon and ends at Bicentennial Park. This course is one of the nation’s fastest. The full course has total road closure. 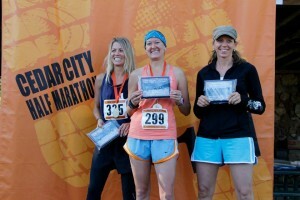 The Cedar City Half Marathon is a perfect high-altitude trainer for those preparing for full marathons. There is also a 5K race in conjunction with the half marathon, hosted by Intermountain Health Care Valley View Medical Center. At approximately mile five, the course begins to flatten out some and continues in a more gradual decent – winding its way along the banks of Coal Creek. At mile 10, after passing the Red Hill runners take a soft left turn off of US-14 across the footbridge to the Canyon Trail. A well-maintained, paved running and walking trail lined with willows and shaded by cottonwood trees. The trail continues through the Canyon Park area where runners are greeted by spectators who flank the grass-lined trail. Leaving Canyon Park, competitors transition back on to US-14 for just a moment as they turn right on to Highland Drive and through a neighborhood that sits at the base of the Red Hill. Making an easy left off of Highland the course winds around the Cedar Canyon baseball complex and past the Veterans Memorial Park. Runners then head north under Main Street and end at Bicentennial Park. You will often hear your name announced to the crowd as you finish the race. Packet pickup for the Cedar City Half Marathon & the IHC VVMC 5K races is scheduled for Friday before the race from 6:00 pm to 8:30 pm and on Saturday, the day of the race, from 5:30 am to 6:15 am. Packet pickup will be held at the Aquatic Center. Runners board buses beginning at 6:00 am. For any questions please call Cameron Christensen at 801-884-2332 or e-mail cameronc@cedarcity.org. Cedar City Half Marathon 2017 | Photos & Results!